Why Is Haitian Company Planning to Ship Disaster Housing to South America? CARREFOUR, HAITI--(Marketwire - March 9, 2011) - Standing among a throng of Haitian laborers and supervisors at the PermaShelter housing factory in Carrefour, Haiti, PermaShelter HR Director Neil Jean-Luis observes, "Our company has made a tremendous investment in establishing a manufacturing operation in Haiti. Hundreds of millions of dollars have been committed to the reconstruction effort, but we can't help but wonder where the money is going. We are one of a few Haitian companies with the ability to produce safe, affordable transitional and permanent housing solutions here in Haiti. We employ dozens of Haitian laborers, drivers, technicians, supervisors, and managers -- yet we are looking at the very realistic prospect of an interruption in production if we don't find some more work soon. That is what has prompted us to begin looking for opportunities in South America." Recent catastrophic flooding in Chile, Brazil, Colombia, and Venezuela have provided just such an opportunity. With hundreds of thousands of internally displaced persons in need of housing in those countries, a number of parties have contacted PermaShelter. 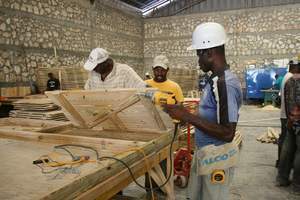 "We have established an impressive manufacturing operation in Haiti where there is a significant need for jobs and where we can readily manufacture transitional shelters and other disaster relief housing structures for consumption here in Haiti," says Jean-Luis. "It is unfortunate that we must look for other markets while there remains so much unsatisfied need in Haiti. Hundreds of thousands of my fellow Haitians do not have homes. We can build those homes, and we stand ready to do so. At the end of the day, though, we have a responsibility to keep our Haitian workforce employed. If that means that we must look outside of the country, then that's what we'll do." PermaShelter expects to build some 5,000+ transitional shelters (t-shelters) in Haiti this year. It plans to export three to four times that number to other points in the Caribbean and Central and South America. PermaShelter S.A. is a Haitian subsidiary of Harbor Homes, LLC, a major supplier of Disaster Housing to the U.S. Federal Emergency Management Agency. About this company PermaShelter S.A.
Haitian workers at the PermaShelter factory at Terminal Abraham in Carrefour, Haiti build transitional shelter panels for use in a t-shelter housing project in Leogane, Haiti.